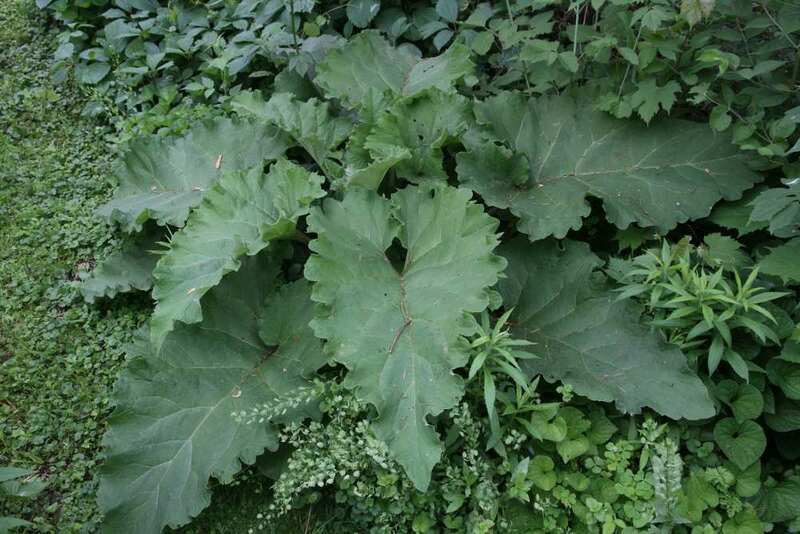 Giant Leaves – What is it? A quick posting today. 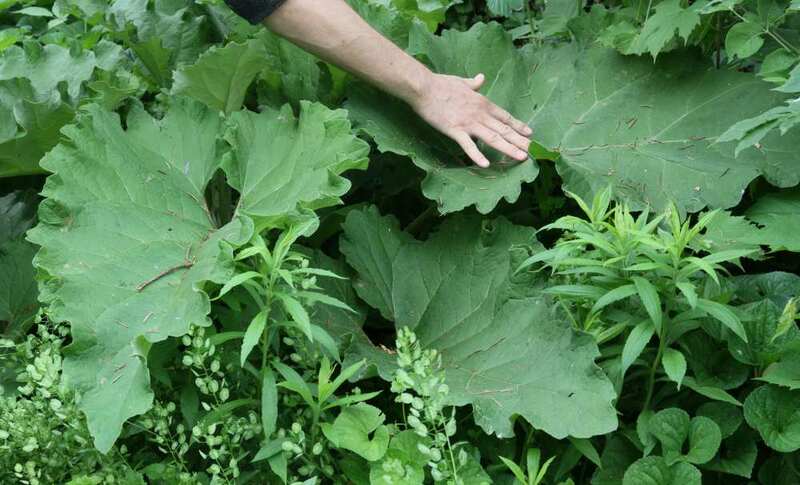 What bi-annual has giant leaves and is a widespread common plant? Although most people don’t know, it’s actually edible with younger leaves and the stalks eaten in the spring and the root can be sliced pickled resulting in something very similar to traditional pickles. To give a sense of size of the leaves, here’s my hand and forearm. Give up? It’s Burdock. We’ll be covering this more on our Suburban Farmacy site later this year. To learn more now, take a look at http://www.ediblewildfood.com/burdock.aspx. 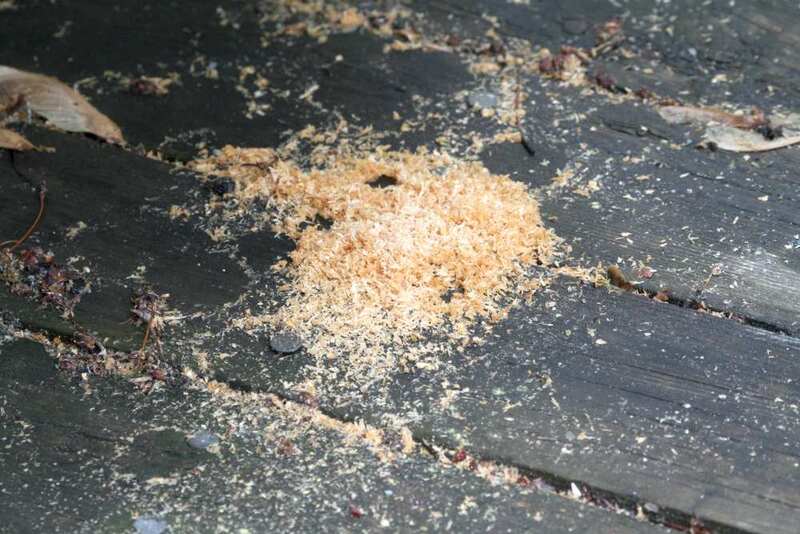 When you see a small pile of sawdust what’s the first thing that comes to mind? Now, if that sawdust is under a wooden fence or perhaps a wooden chair, would you change your answer? 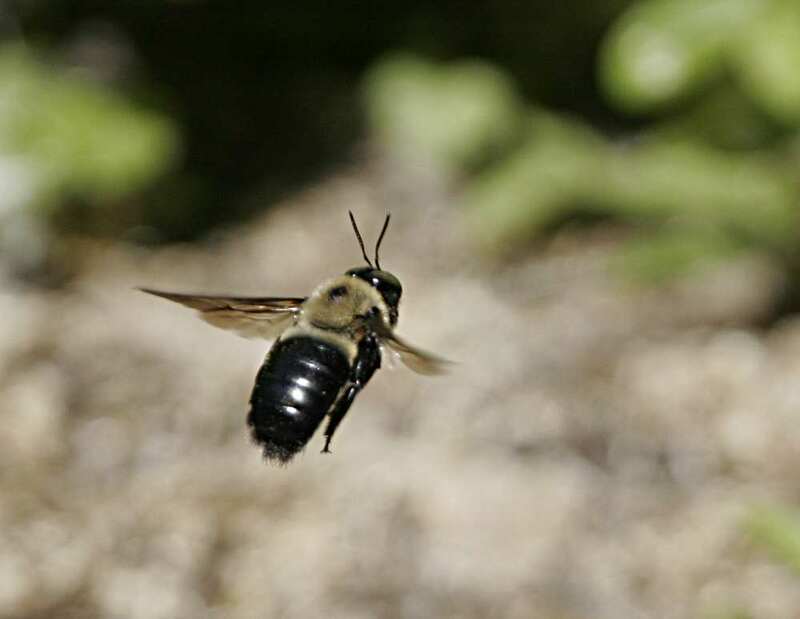 There is a bee, similar in appearance to the bumble bee and in the same Apidae family, called the carpenter bee. 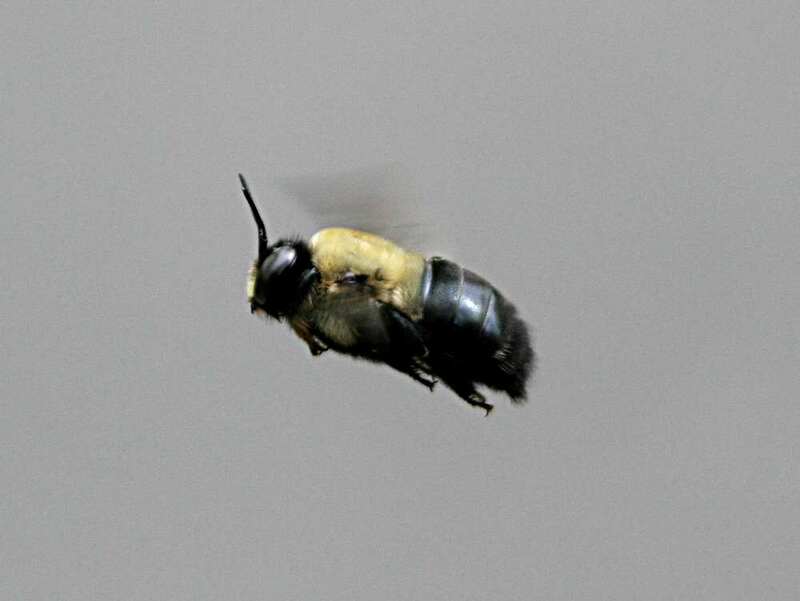 Actually there are hundreds of different species of the carpenter bee around the world. See more at Wikipedia. Upon seeing the pile of sawdust I looked under the chair and sure enough, there was the tell tale hole. It was made by this bee. From our experience they are pretty much harmless. I’ve never had one come at me or try to sting or act aggressive in any way. At least not towards humans. They build their little holes and lay a few eggs in there after erecting thin walls between each egg. The walls are constructed with the wood particles that were originally removed. Woodpeckers and a few different fly larvae predate the bee’s larvae and the bees themselves are pollinators to many flowers. Now I said they are not aggressive but that isn’t entirely true. To humans I’ve always seen them as harmless but with each other they’re a bunch of battling bugs. You’ll see one hover in the general area of its nest and quickly go after any other ones that approach too closely. They usually then return to just about the same place to hover again. For us, we can take advantage of this activity to know where they will be in the air, get the camera ready and then be able to get shots of them in flight while they’re hovering. 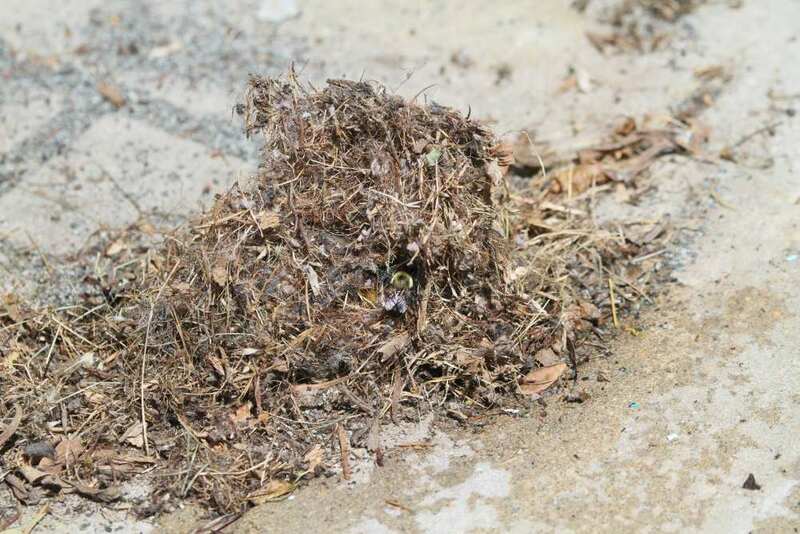 Not all bees make nests that hang from the eaves of your house or a tree or any other underside surface. 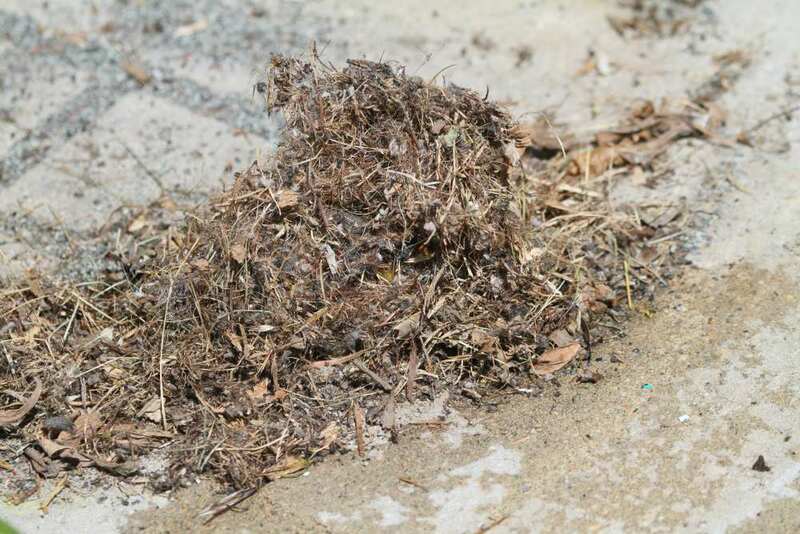 Some nest in cavities, some in the ground and some like to make nests. This spring, when flipping over one of our water barrels I found a sizeable nest under it and assumed mouse, that is until the nest started buzzing. Below are two almost identical shots. 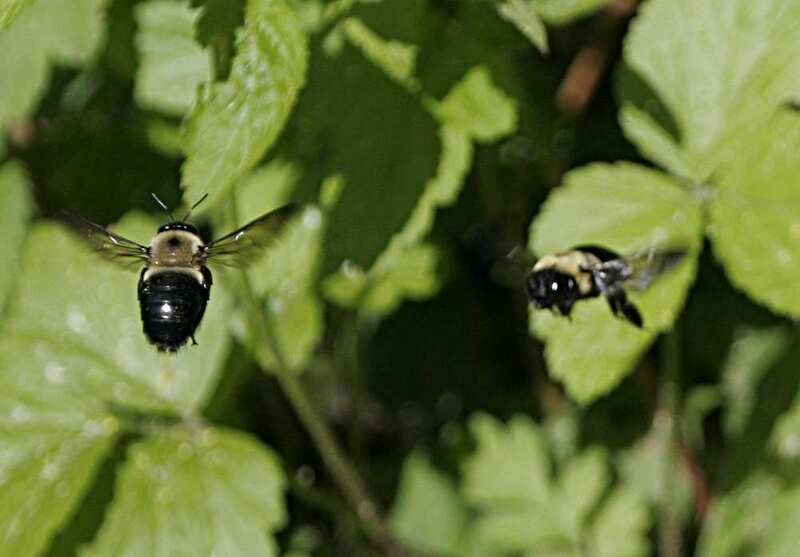 One is the test, the other shows a bumble bee that had returned and was entering it. 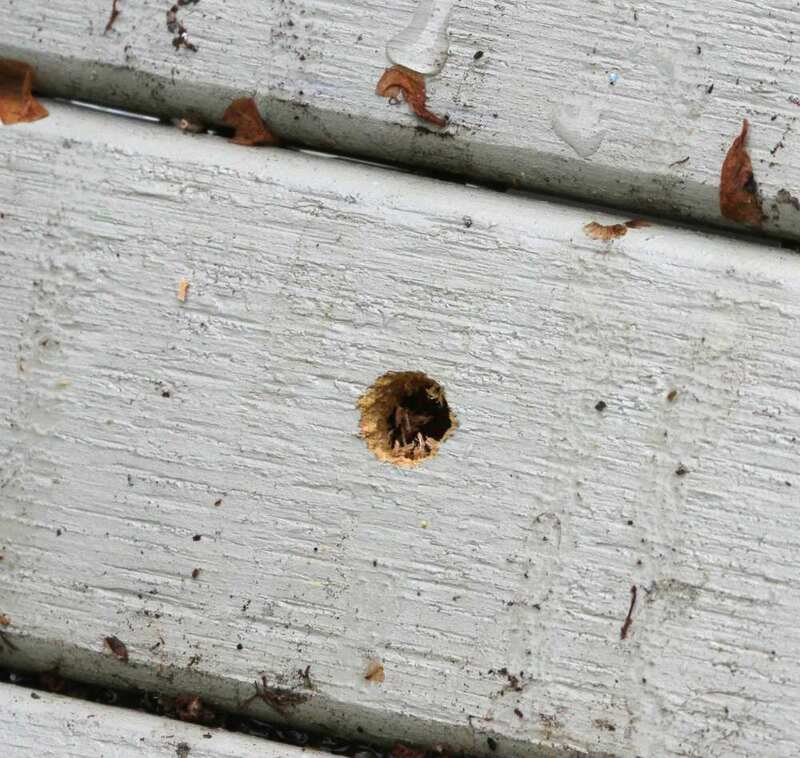 Thankfully I didn’t just flip the barrel and drop it as I would have squished the nest. With a bit of relocation the nest was moved to the side and while the bumble bees buzzed a lot and some flew around, hours later when I checked on it they were still using it. Last year we bought a couple of Comfrey plants. They did OK but never really flourished. This year only one of the two plants came up. The cold of winter must have killed off the other one. Our remaining plant has really exploded with growth. Last year it was just a foot tall with a half dozen leaves. Also, unlike last year, it put out flowers this year. Purple flowers reminiscent of Virginia Bluebells. We purchased these with the intent of using them medicinally. Salves and teas being two common uses. 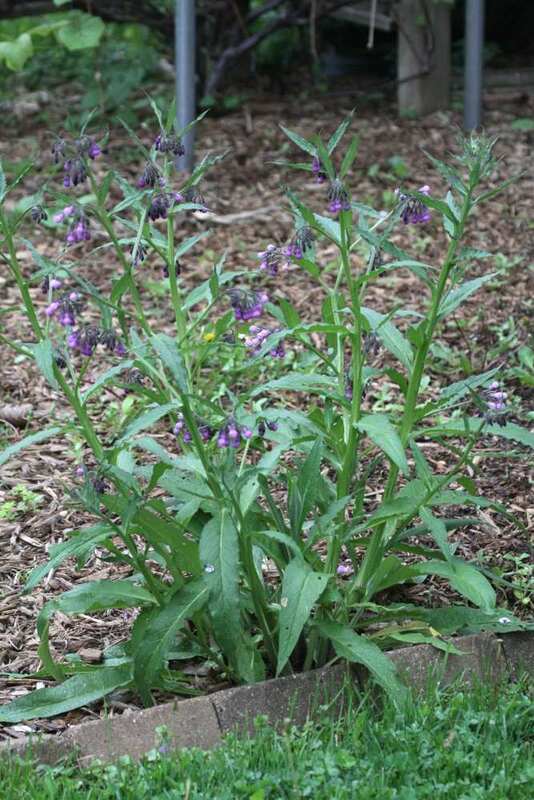 Find more details at http://www.motherearthnews.com/natural-health/comfrey-medicinal-uses-zmaz92jjzshe.aspx. 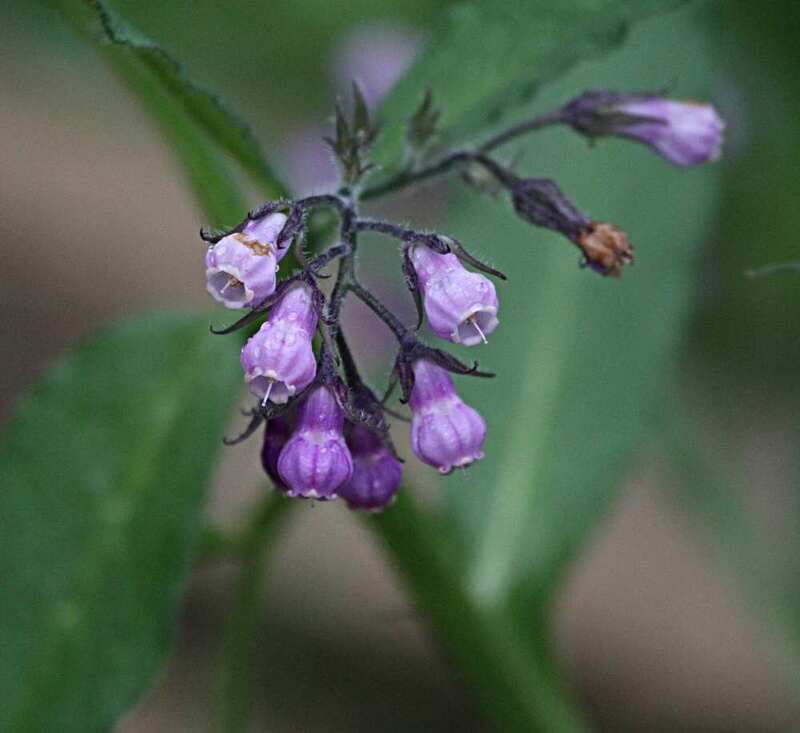 Over the recent years we’ve become very interested in the plants already in our yard, and those we can successfully grow here, with an multi pronged approach. Plants that benefit the environment (food for insects and birds), can be eaten by us and can be used medicinally. We’ve even started a related website for these topics at suburbanfarmacy.com which reflects our suburban homestead and a play on farm (food) and pharmacy (medicine). What… might you ask… is a Squeaky Cow? 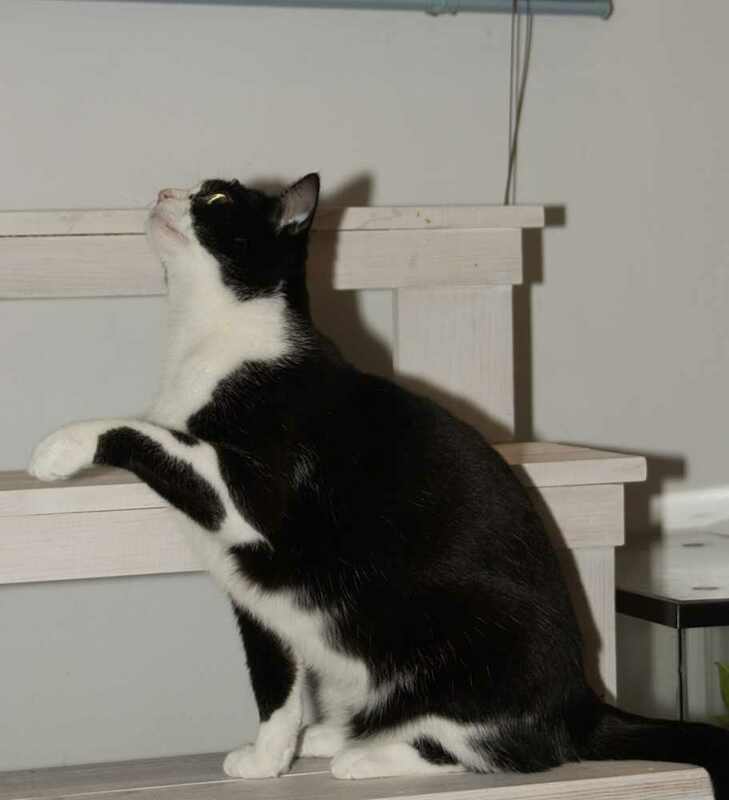 About thirteen and half years ago a small little furry black and white critter showed up at our deck door. His coloration looked almost like a cow. His voice was a high pitched, almost squeak sound. Thus the name, Squeaky Cow. We put out a bit of food for him but after eating it he disappeared back into our yard. One week later he had returned to our yard and came up to our deck door once again. This time we put a bowl of food down, opened the door and he came in to eat. We closed the door after a brief freak out period he decided a warm house and three squares was much better than trying to survive in our yard with the coyotes, racoons and all sorts of other things much bigger than him. The little guy, small enough to fit in our cupped hands, soon grew and grew. Of course eating all sorts of goodies helped. 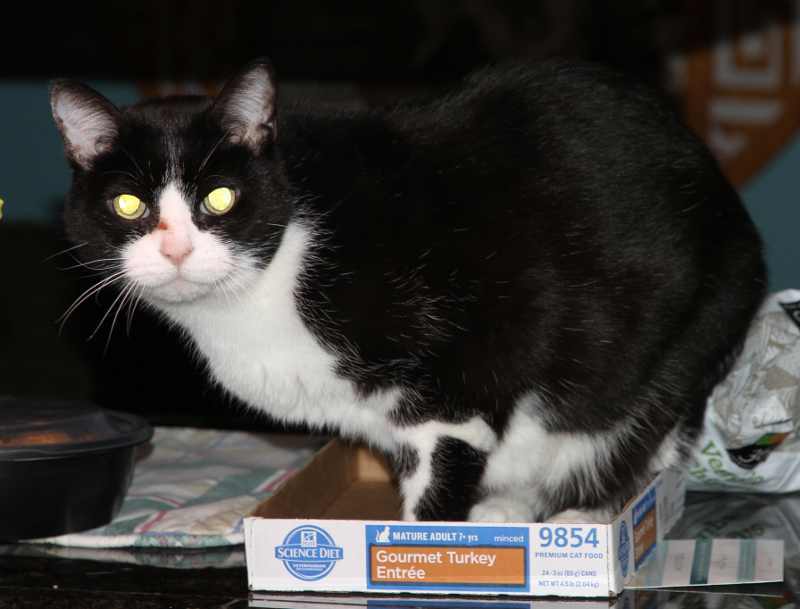 While he liked most brands and flavors of cat food, things like Chicken on a Beer Can, canned sardines and ice cream (melted first) were definitely on his favorite list. For exercise his favorite game was “stringy”. Basically just a dangling string he’d swat at, or for variety, the same string dragged underneath a thick comforter or blanket. We have no idea how he could tell exactly where it was under there, but a focused stare, a quick tilt of the head to pinpoint and he would pounce right on it every time. 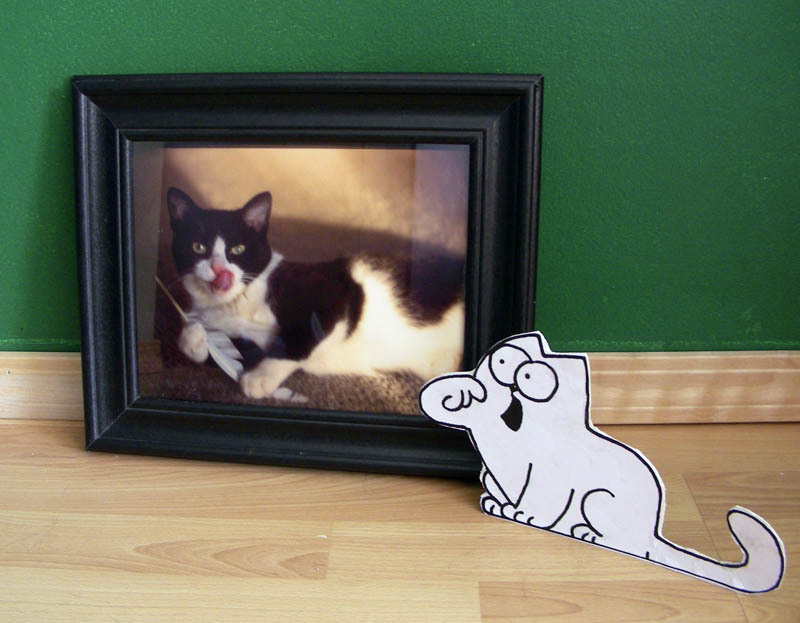 A few things would scare Squeaky (we normally just call him Squeaky). Aluminum foil torn off a roll would send him running as would the vaccuum cleaner. He showed his intelligent side too. He taught us to make a noise before we were going to vaccuum and he’d then make a determined march right to his favorite closet to hide in. It allowed us to warn him first and help to not stress him. Bring out a camera and most of the time he’d head the other way too. Perhaps not so much afraid as maybe just camera shy. Regardless we still got some good shots. Sometimes the timing was just right. Once he even played along as we slipped a miniature sweater from a teddy bear on to him. It actually fit just about perfectly. 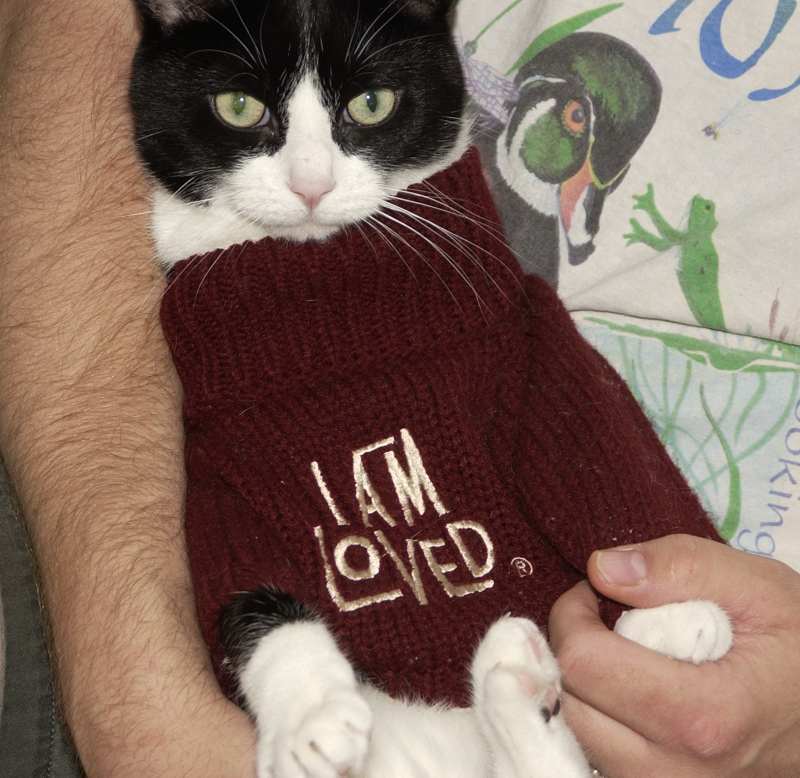 And no, we don’t normally dress our cats, this was a one time thing. He seemed to listen for the sound of the desk being opened or a computer starting up. To him that meant the opportunity to nap in a warm lap for hours at a time while we were working on whatever project we silly humans busy ourselves with. Each morning he always hung around when either, or both, of us were leaving and we soon learned that he was expecting a good bye petting. Over time that turned into our little ritual of always telling him he is a good boy and other good sayings (they evolved over time) along with a bit of petting. He purred and purred each and every time. In late December we noticed his shoulder looked a bit swollen. It didn’t seem to bother him and we thought perhaps he just hurt it. Over the next few weeks it wasn’t shrinking and in fact seemed to be growing. We took him to see Dr. Grover our favorite vet. 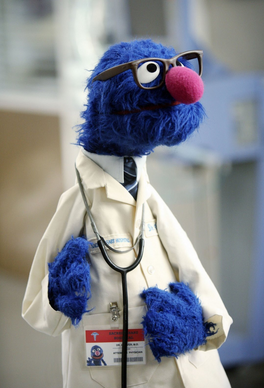 No, not that Dr. Grover… although funny enough the real Dr. Grover has the same picture of the Muppets Dr. Grover on the back of his exam room door. He gave Squeaky a thorough exam, as he always does, and after running a couple of tests came back to tell us the bad news. Cancer. A sarcoma. The tumor was in his shoulder and chest muscles and a x-ray indictated spots in his lungs too. Without the lung issues we had surgery or radiation options. With it in his lungs the options were much less, as in none. Six to twelve months at best. The recommended treatment was to take him home and spoil him rotten. Well, six months has turned into about eight weeks. The tumor, the size of half a golf ball back at the beginning of January is now the size of half a grape fruit and still growing. 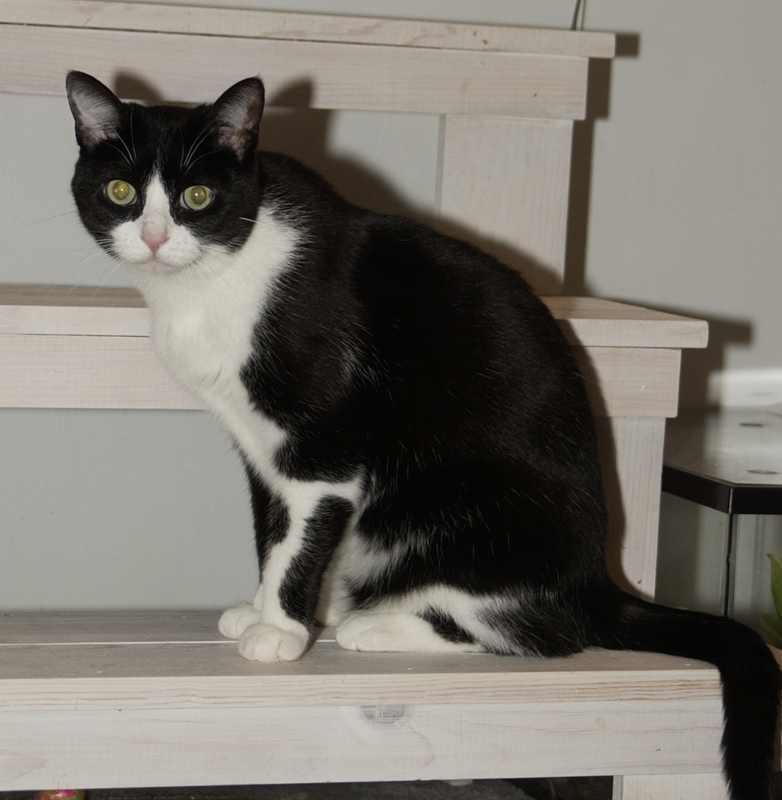 His front leg is being forced out of position making him limp when he walks. As many tumors do, it’s stealing all the nutrients he is taking in. We’re feeding him much more often and larger portions than normal and yet the weight keeps dropping. By the end of February he is mostly skin and bones and has all but stopped using one of his rear legs too. Turns out a minor case of arthirtis becomes severe when the tumor steals nutrients from the muscles and bones. The time has come to say good bye to our Squeaky. 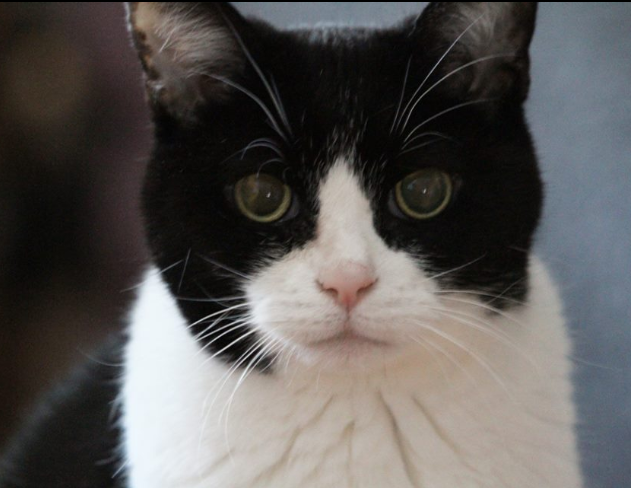 On saturday morning at the end of February, Dr Grover helped our furry companion of 13+ years to cross the Rainbow Bridge. I’m sure Shmooshy and Sunday were waiting for him and are now showing him where all the good food can be found and where the forest of “stringy trees” grows. 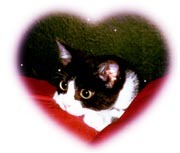 Squeaky, you were and always will be loved. Sleep good our sweet angel. Be at rest and feel no more pain. One day we’ll be together again and you can have all the lap time you could ever want. This year we tried planting some new seeds in our gardens. 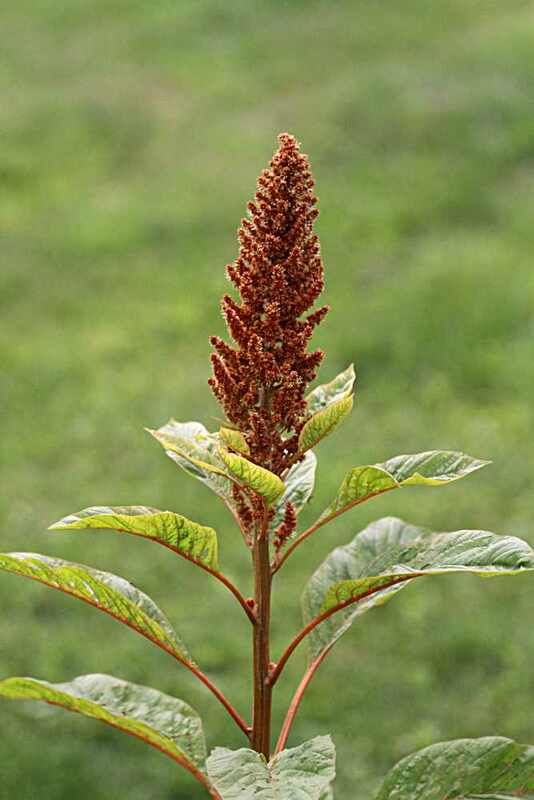 Amaranth. Specifcally Golden Amaranth and Molten Fire Amaranth, both from Baker Creek Heirloom Seeds. Sadly none of the Molten Fire grew, but happily one of the Golden seeds sprouted and grew. The seeds are very tiny. Smaller than poppy seeds and about a quarter teaspoon worth of seeds was planted. From the one seed that took, the resulting seed head gave us about 5-6 tablespoons of seeds. We’ll definitely be trying again next year. The seeds are not edible when raw, however cooked they are fine to eat. Given their small size it isn’t normally eaten on its own instead you find it usually baked into bread or popped and mixed with honey. 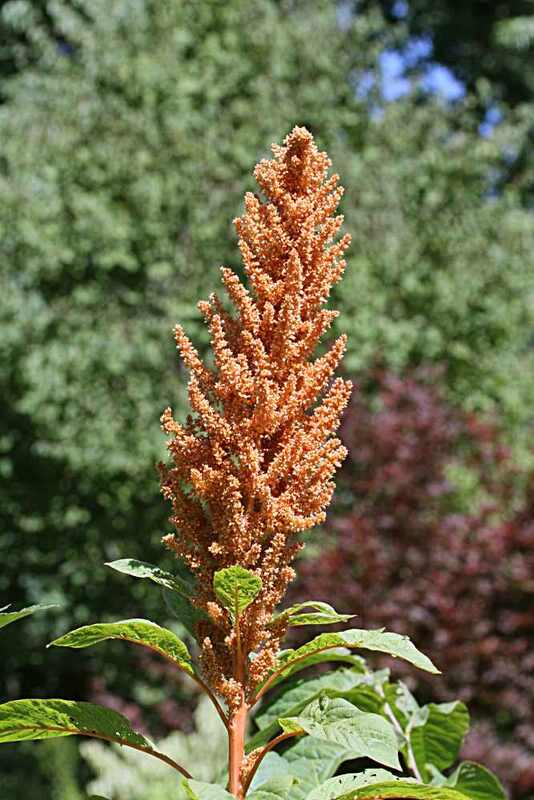 The grain itself can also be pressed to extract amaranth oil. We didn’t get enough yield to eat any, but hopefully next year will give us a number of plants and much more seed, some to save and some to cook with. A single seed head can yield up to a pound of seed. Since the plants are quite attractive in appearance we also tried growing them in our front yard. With their foilage and seed heads they make a nice decorative plant that also gives us an edible yield. More and more we are looking for plants that not only look nice but also serve other roles. Perhaps food for us, perhaps critter (bees, humming birds, etc.) attractors. 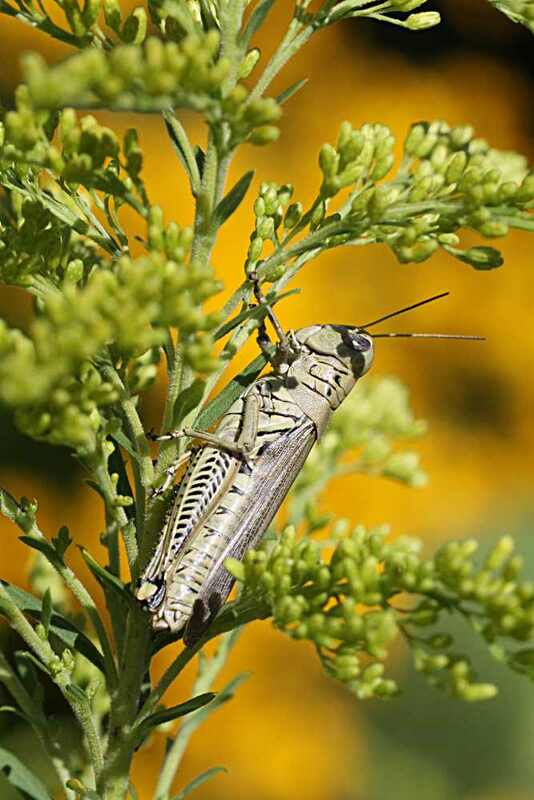 In mid September, over the course of just a few minutes I observered a number of insects preparing for winter. Bees gathering nectar and pollen. Spiders spinning webs in preparation of catching their next meal. 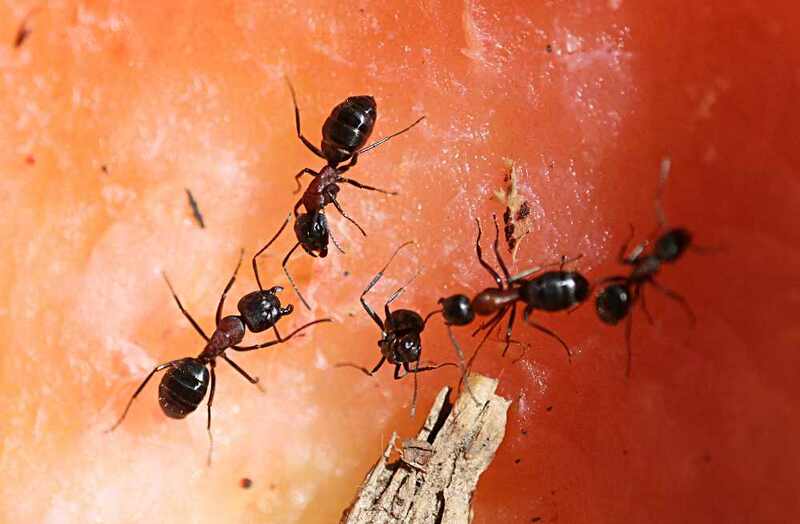 Ants enjoying a watermelon rind we had left on the ground. And a grasshopper, well, just sitting there. The first thing that came to mind was the Aesop fable of the ant and the grasshopper.